The Entergy New Orleans outage map lists 11 a.m. as the estimated time for restoration. NEW ORLEANS – Thousands of Entergy New Orleans customers lost power for more than an hour after a cat got into a substation Monday morning. The outages began around 8:30 a.m. Monday morning. 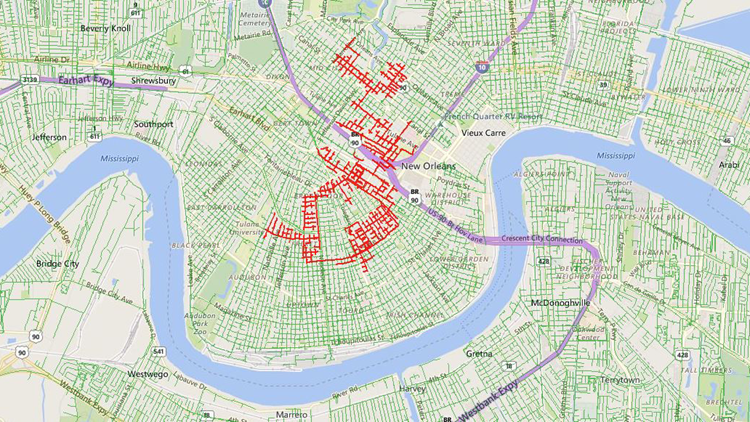 All of the 7,556 people who lost power in Mid-City, Central City and Uptown, had power back before noon according to the Entergy New Orleans outage map. A statement from the company said a cat got into a substation and caused a flash when it touched the equipment. The outage caused traffic light failures in some of the city's key thoroughfares and intersections as rush hour was coming to an end.It also temporarily closed businesses and had those that have to start preparing food for the lunch rush put behind on their preparations. "Honestly it's unbelievable. I wouldn't think an animal would be able to do that," Duc Bui, Fharmacy Sous Chef, said. Business owners say the frequency of the outages is frustrating. "It would be okay if it was a one-time thing," said Justin Pitard of Avery's restaurant on Tulane Avenue. "It's a really big inconvenience. I have no idea what the issue is, but it would be nice if we could find out." Entergy New Orleans said it is unusual for a cat to get into a substation and around protected devices. The company said it installs protective devices to keep animals out of the equipment to protect the animals and prevent power outages. "When this happens, the animals, unfortunately, do not survive the high-voltage contact," a tweet from the company said. "I don't know how a cat got into the place where the main system is at but I sometimes things happen," resident Sylvia Davis said. A spokesperson from Entergy released a statement that read in part, "We understand the frustration even the shortest of power outages can cause and we're focused on improving our system." Entergy has hired a third party to look into reliability issues to figure out what they need to do to make things better and information must be submitted to the City Council by the end of October.